We fired up the kiln on a hot day. 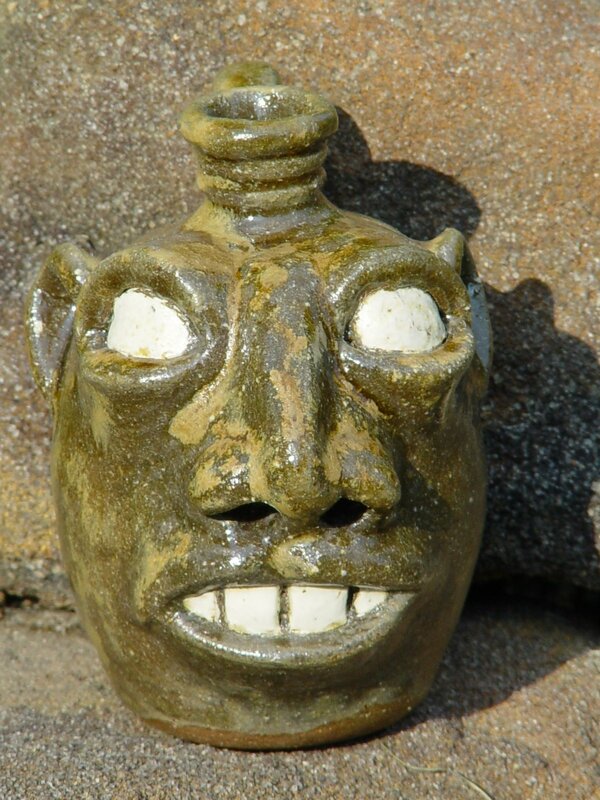 It was 102 degrees F both days the kiln was fired. It took us about 40 hrs. to bring it up to around a cone#11. Thank god Brian showed up at about hour 37 because I was suffering from extreme heat exhaustion, having got chills and all of that scary stuff earlier. Brian represented a pure, rested, air-conditioned hunk-o-meat and promptly jumped on that fire and set it to blasting! I think the kiln was sick of me and my whining. 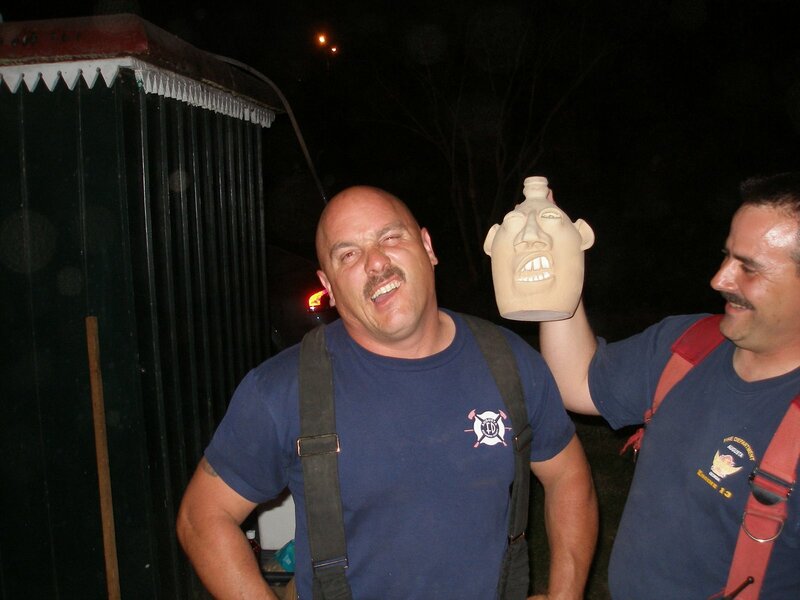 Brian brought it home with the front screaming hot at about a cone #11 in two short hours. I don’t think Sarah and I could have done it without his fresh body there those last 2 hours! I owe you big time, Brian! The past couple of firings had been problematic due to some of the old heart pine wood on hand had lots of white-wash on it. Now, who’d have ever thought that stuff could cause so many problems? I guess white-wash is made from seashells and who knows what else. Calcium Carbonate or something. We were recycling old wood. 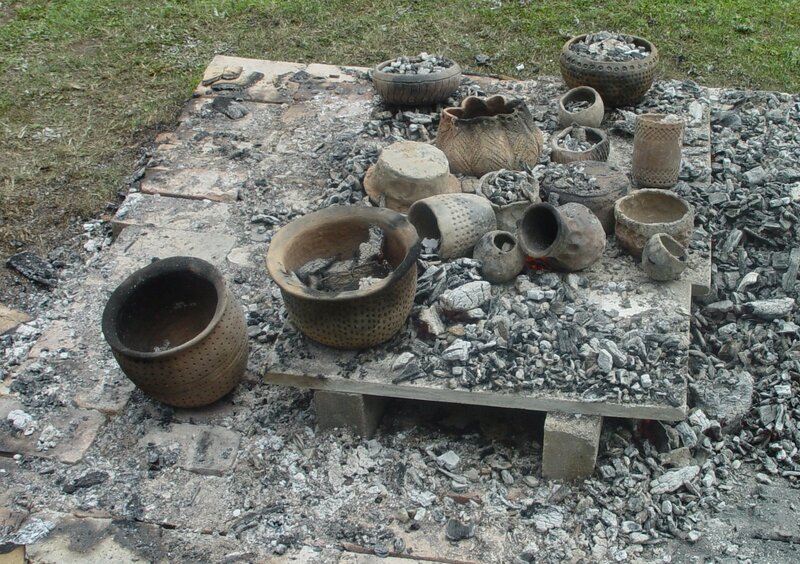 On all of the pots, well, I mean all of the pot’s sides facing the fire, the residuals from the white -wash caused a very pronounced gold colorization. And I mean Gold! It was in stark contrast to the normal drippy ash glaze on the other side of the pots. I had a tremendous amount of this fine old heart pine. I couldn’t burn it all over the course of 3 firings, so I hauled it home to the baby groundhog kiln located there. I couldn’t bring myself to toss it all in a dump somewhere. The gold color will represent one more lesson in wood-firing stoneware pottery in the Old Edgefield tradition. When’s school gonna be over? The heat of those two days sure took a toll on me. 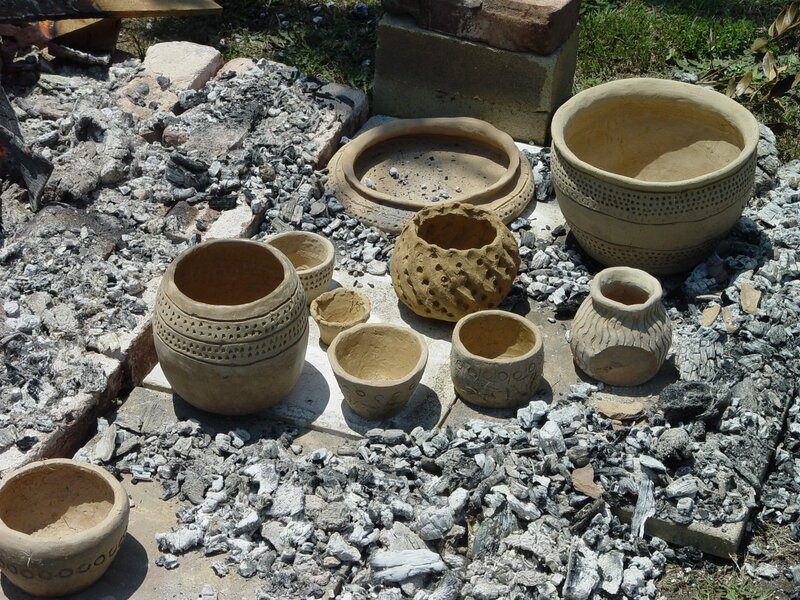 On the first day of firing the groundhog kiln I also hosted our clay group, Clay Artists of the Southeast (CASE), doing our first pit-firing of pieces we made like the Stallings Island people. 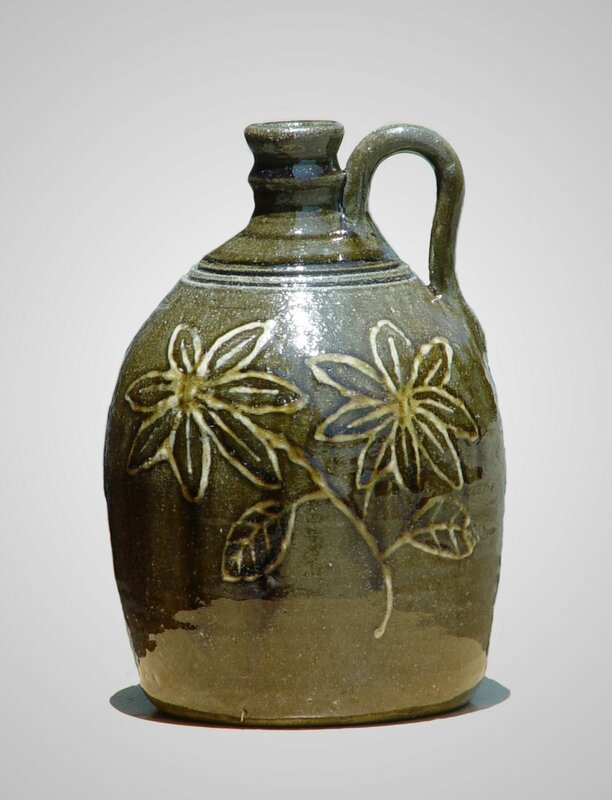 These pots were made from indigenous clay with Spanish Moss mixed into it to temper the clay. 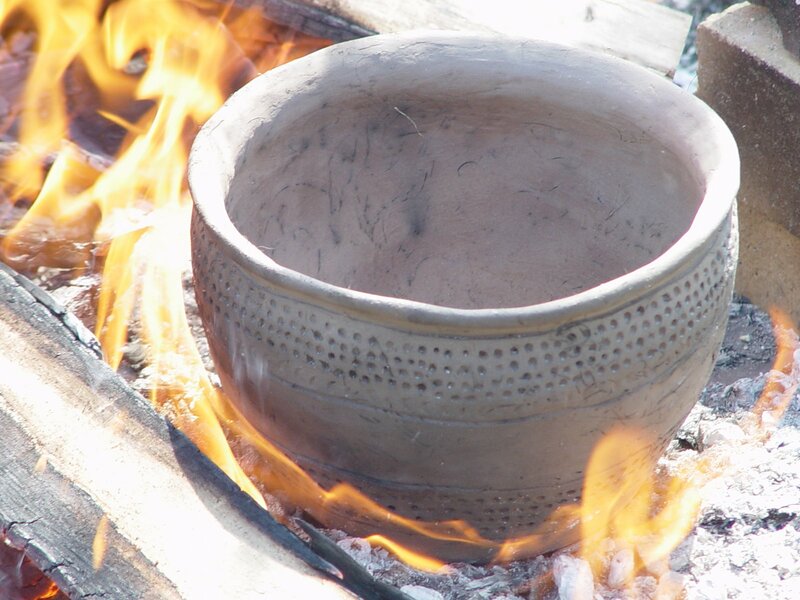 By temper, I mean it opens the clay body up some and allows it to dry and fire over open flame without cracking. We took about 4 hours for the whole process and got some nice pieces out. Unfortunately, 2 large pieces got licked by the flame too soon and popped a couple of flakes out of the sides. I hosted a second firing a short while later and it wasn’t quite as hot, only a balmy 96 degrees with about the same in humidity. Some fool had turned on the sprinkler system at Enterprise Mill and most of my wood had got thoroughly soaked over-night before we started the pit-fire at 8:00am Sat. June 28. I had a lot of sweet thin slats under a tarp that I was saving to blast the groundhog kiln with on the next firing which I had to use for this primitive firing. Well, it was all worth it because we got some nice stuff out and didn’t loose a thing really. 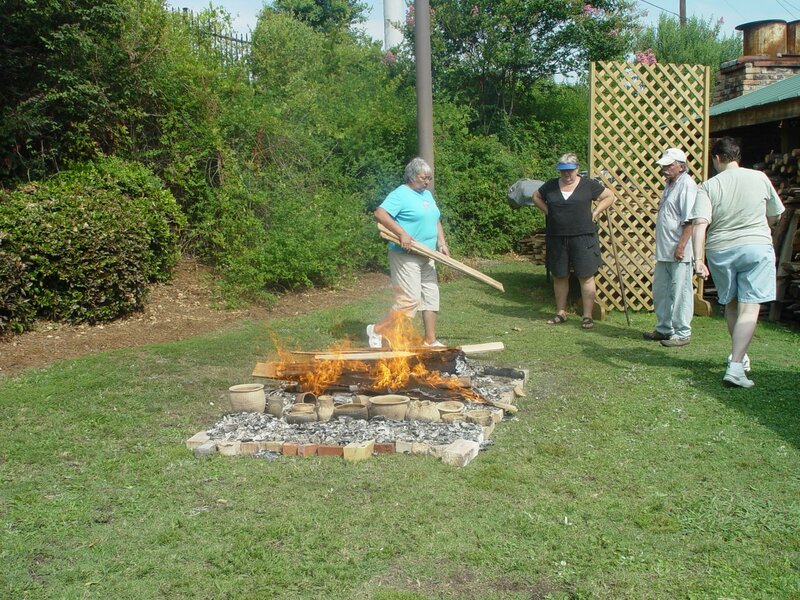 The primitive stuff will go on display at Augusta State University as a part of the Westobou Festival coming up in September 08. 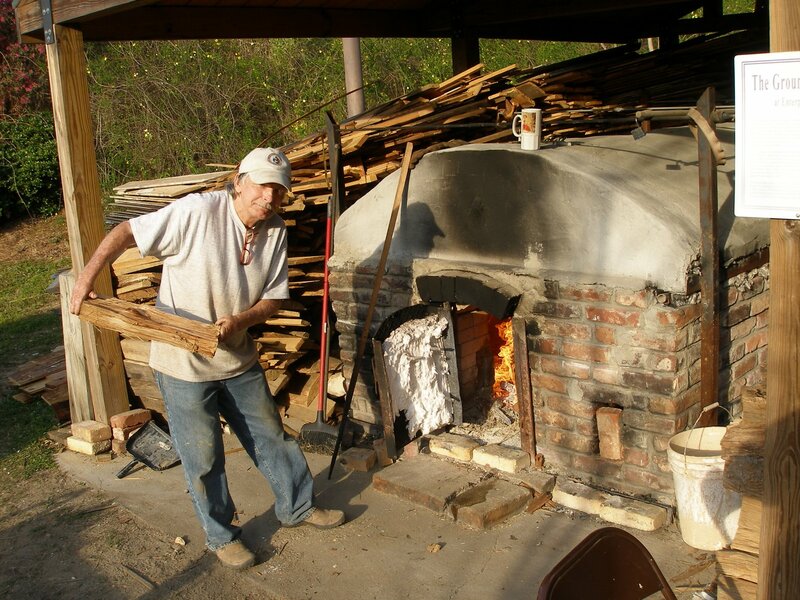 I’m ready to load the groundhog kiln as about 2 loads are backed up after spinning my wheels with the white-washed wood. I’m laying in the last of the new wood for the firing and hope to hit it in the next two weeks. Oh! 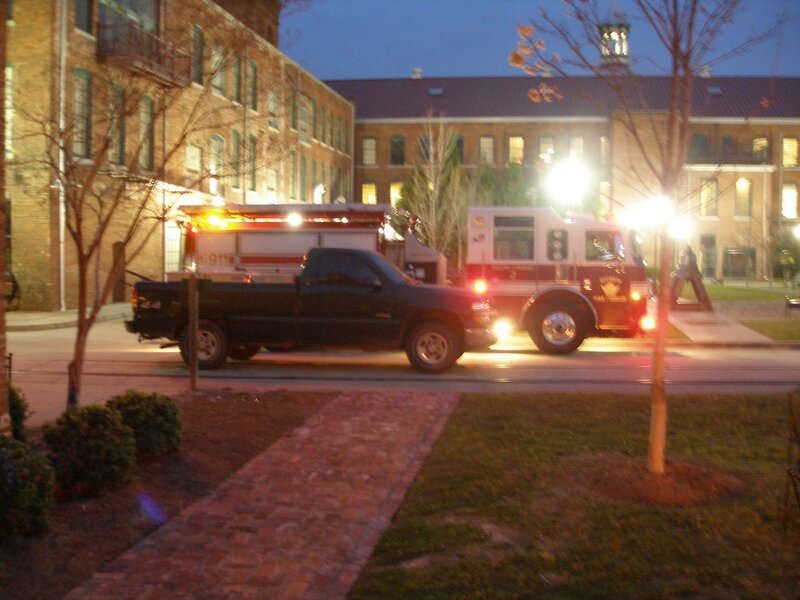 A good friend, Dean, was on hand the night of one of the past firings this Spring when our fearless firefighters showed up with that damn giant, loud, ladder truck right in the middle of the firing. Here’s a couple of photos. Well, I got to shaking so bad I could barely croak out a ” like hell you are” response. He started laughing and replied with a stinging “GOT ‘CHA”. What a firing! A better match couldn't be had!